What would it be like if you were able to handle the many frustrations and challenges of your life without turning to food for comfort, soothing and distraction? Can you imagine your life free of worries about your weight and health; a life without dieting and calorie counting? How about no more frustrating visits to the closet, wondering which size will fit today? Picture yourself feeling good every day and liking what you see reflected back in the mirror. If you’re ready for an alternative to dieting, this book is for you. It will help you address the true causes of your overeating or imbalanced eating. I won’t ask you to count calories or weigh and measure food. Nor will I suggest exhausting workout routines. Your body has a natural weight, not overweight and not underweight. Maintaining this weight should be easy, comfortable, and intuitive. Most likely you’ve lost some of this intuitive connection to yourself and you’re feeling imbalanced. Perhaps you’ve lost touch with your signals on many levels, and when symptoms surface you ignore or medicate them. You find yourself unable to practice suggested lifestyle changes or address health challenges because of an emotional, physical, and spiritual disconnect that sabotages your best intentions. Your mind, body, and spirit may be screaming that they’re out of balance. This book is your repair manual. It’s your guide to learning and practicing self- and soul-care skills and body-balancing principles that will help you reconnect to yourself, pay attention to your signals, and respond appropriately to meet your needs without turning to food for comfort, soothing, distraction or excitement. 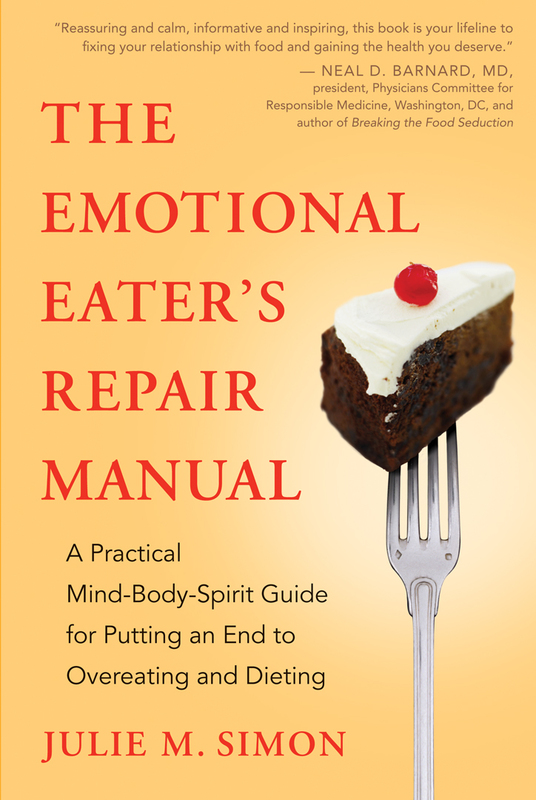 “With The Emotional Eater’s Repair Manual, Simon has written a prescription for emotional eaters that is clear, frank and effective.Simon begins by explaining the problem…and the fact that another diet cannot possibly solve it. By framing the problem as emotional hunger, she is then able to explore how various forms of self-care can resolve the insanity that goes along with chronic overeating.The book is divided into three sections: mastering self-care skills, tuning up biochemistry and filling up spiritual reserves. I found it to be very well organized, and each chapter clearly made the case for skills, principles and practices that are prescribed. As I’m someone who has been medical director of a large rehab and worked with many hundreds of people with disordered eating, I have some experience in this topic.I can say with certainty that the recommendations in this book make sense and represent a very effective approach to managing emotional eating. “The Emotional Eater’s Repair Manual is the type of diet and self-help book that people who emotionally eat need to read. People who eat for emotional reasons can go on a diet and exercise program and lose weight, but often they end up right back where they were before because the underlying problems weren’t ever addressed and fixed.Julie M. Simon wrote this book based on her “Twelve-Week Emotional Eating Recovery Program” that addresses weight gain as part of an emotional and spiritual hunger and physiological imbalance. Treating someone’s problem in this way treats the whole person, not just the number on a scale, and I for one really appreciate this philosophy and outlook on it.This book doesn’t offer a quick fix to a lifelong weight problem, but it does help the reader to see their life differently, especially in relation to their eating problems. If you have struggled with your weight and are need of some help, this may just be the book that can help you with it.I highly recommend it.